Fraternizing and socializing are important aspects in keeping a small community cohesive. In Olean, Transfiguration Church and fraternals like the Polish National Alliance were the social outlets of the early Polish community. As these organizations evolved, new clubs were born, including the Pulaski Club of Olean. 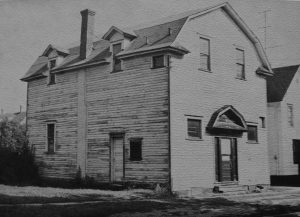 The Pulaski Club of Olean was established in 1948, but its origins can be traced back to the Holy Name Society at Transfiguration Church which started around 1937. The Holy Name Society, an organization popular with the younger members of Transfiguration supported the parish by sponsoring dinners and dances. As the club grew, Father Glazik urged the members to find themselves a building for their meetings and social functions. After much searching, the society failed to find any available building for sale in North Olean and began sharing space with the St. Stephen’s Lodge at 107 East Elm Street. In the autumn of 1945 three lots on North Union were placed on the market, and the Holy Name Society quickly purchased them. As planning for their building got underway, the society decided to change its name in 1948 to the Pulaski Club of Olean. The charter members of the club included, John Zatycki, Joseph Sokolowski, Theodore Sternad, Joseph Kasperski Sr., and Father John Glazik, with Michael Liwa serving as the first president. A year later, the Ladies Auxiliary to the Pulaski Club was organized under the leadership of Louise Budaj. Both organizations continued to support Transfiguration Church in various ways over the years. It would take three years to get everything into place, and on September 26, 1951, President John Prymak announced that the Pulaski Club would be building an $80,000 clubhouse on its Union Street property. The original plans designed by Olean architect Metcalf Shaffer called for a two-story 11,000 square foot building with clubrooms, lounges, and a 66 by 100-foot ballroom, but the completed building ended up being smaller in size. At their own home, the Pulaskis had adequate space to hold any event they wanted. From dinners for the sports teams they sponsored to a two night concert by Frank Yankovic and His Orchestra. The club also donated their time and money to the Community Chest, Red Cross, and held an open Christmas party for the children of Olean. The club also became a destination for visiting Polish American dignitaries and out of town friends of club members. The Pulaski Club is also home to two important pieces of Polish art. 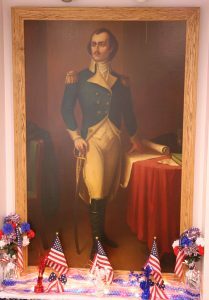 The first is a life-size portrait of General Casimir Pulaski in the lobby that was painted by Polish American artist Joseph C. Mazur in 1929 as part of the sesquicentennial. The other is a Polish tapestry entitled the Krakow Wedding that was purchased by the Ladies Auxiliary in honor of their founding president and the many wedding receptions the club holds every year. Over a half-century after its founding and construction, the Pulaski Club still maintains its Polish character and a healthy membership, with both Poles and non-Poles among its rank and file and leadership team. "30th Year Celebrated By Ladies Auxiliary." Olean Times Herald [Olean, NY] 11 Dec. 1979: 15. Print. 1948 - 1973 25th Anniversary Celebration Pulaski Club Of Olean, Inc. Olean, NY: Pulaski Club Of Olean, 1973. Print. "Andrew Grega Funeral Held." Olean Times Herald [Olean, NY] 26 Aug. 1937: 11. Print. "Blackwell Blanks Kiwanis Eagles Win 3-0; Pulaski Triumph." Olean Times Herald [Olean, NY] 29 June 1950: 15. Print. Dancing at the Pulaski Club. Olean Times Herald [Olean, NY] 15 Jan. 1954: 12. Print. Karney, Alfred. "Pulaski Club Celebrates Pol-Am Heritage Month, Dyngus Day, Hosts Wedding Receptions, Festivals, Benefits." Am-Pol Eagle [Cheektowaga, NY] 10 Nov. 2016: 8. Print. "Olean Pulaski Club To Build Clubhouse." Jamestown Post-Journal [Jamestown, NY] 27 Sept. 1951: 10. Print. "PGSNYS" Polish Parishes of WNY - Detail. Transfiguration, n.d. Web. 19 Nov. 2016. Pulaski Day Committee. Pulaski Day "68". Olean, NY: Pulaski Club, 1968. Print. Purchase Offer. 26 Nov. 1945. North Union Street, Olean, NY. Rogozinski, Steve, and Bill Martin. "The Polish People Came in 1902-04." Sandpumpings Magazine Issues 1, 2 & 3. Olean, NY: Olean High School, 1977. N. pag. Print. "Servicemen’s Party At Pulaski Club." Olean Times Herald [Olean, NY] 17 Aug. 1951: 3. Print. "Third Annual Pulaski Club Sportsman's Banquet." Olean Times Herald [Olean, NY] 15 Jan. 1951: 3. Print. "Transfiguration Started Pulaski Club Here In ’48." Olean Sesqui Centennial. Olean, NY: n.p., 1954. 6-I. Print.